There’s been a lot written about how the Israeli army has been using social media to broadcast the details of its latest military campaign against Hamas — live-tweeting rocket attacks, uploading YouTube videos of hits on specific victims, aggregating Instagram photos from the battlefield, and even posting infographics to a Tumblr blog. This obviously has marketing and propaganda value, but that isn’t the only way this modern media campaign is changing the nature of military strategy: since social-media tools are inherently difficult to regulate and are multi-directional in nature, they can be a very dangerous double-edged sword, and we are only beginning to see the full repercussions of that. “Bloggers, tweeters, and Facebook friends of Israel were reminded by our IDF contacts not to say exactly where rockets have landed or even when/where alert sirens have blared… The siren and landing reports are helping the terrorists hone their aim, making it a bit easier to target/kill civilians. 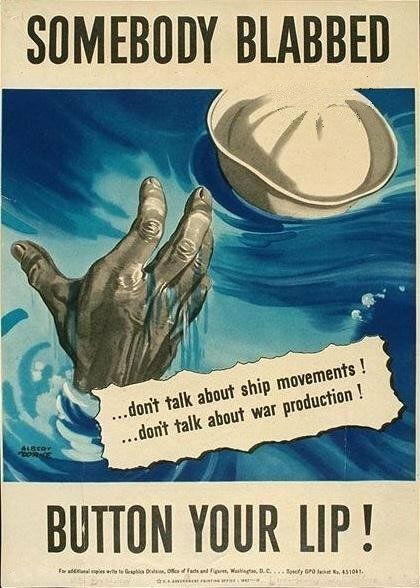 Anyone over a certain age or with a knowledge of military history will no doubt see the similarities between this and the “Loose Lips Sink Ships” propaganda campaigns of World War II, which warned citizens of the U.S. and other Allied countries that spreading specific information about military attacks could threaten the war effort. But that was aimed at a much smaller phenomenon — namely, people talking to others who might have connections to the military. Now, anyone with a smartphone is capable of publishing not just a few sparse details about an attack but specific longitude and latitude co-ordinates, images, video and more. Think about what happened when the U.S. Navy Seals targeted Al-Qaeda leader Osama bin Laden at his compound in Pakistan: a computer programmer named Sohaib Athar spent a couple of hours live-tweeting details of that attack without even knowing what he was doing. If the Navy had been involved in a more prolonged attack, those details could have easily helped Al-Qaeda determine how many troops were involved, what types of aircraft, what kinds of weapons, and much more. That kind of data can change the nature of a military campaign, especially when combined with “big data”-style algorithms and mapping technology that is now commonplace. And while the Israeli military may think that it is somehow controlling the flow of information with its live-blog or its Twitter account or its Tumblr propaganda campaign, it is just one stream in a giant ocean of data flowing from individuals who are both observing and participating in the attacks — including soldiers who are posting photos of themselves to Instagram and Facebook, pictures of drone missions that are being aggregated through a site called Dronestagram, and many other similar examples. Everything that is geo-tagged becomes a potential source of crucial information about the Israeli action and the response by Hamas. Part of my interest in this phenomenon is just the way that the media we use helps shape the world around us, but I’m also fascinated because my father was a Canadian Air Force officer who worked with NATO on designing what are called “command-and-control systems,” including the military version of modern information theory — in other words, figuring out how information flows can affect military strategy. In the not-so-distant past, crucial information flowed primarily from the top down, and battlefield data was hard to accumulate or distribute efficiently, apart from the usual word of mouth and rumor-mongering engaged in by soldiers. The internet and social tools have altered that structure significantly, however, despite the military’s best efforts to regulate them. And during a real-time campaign, social media may be a great way of distributing the government’s marketing message about the conflict, but it’s also a great way for anyone involved to publish what could be critical details of an attack — and that is difficult, if not impossible, to defend against. Great post and I like the way you put it together. One comment though regarding the tweets on the UBL hit. You’re assuming that AQ would have been monitoring that specific guy’s tweets or the conversations and then had the ability to communicate real time after crunching the data using “â€œbig dataâ€-style algorithms and mapping technology that is now commonplace.” I’m not so sure that is within the realm of the possible for guys who communicate by having people carry thumbdrives across the globe. Just the same.. great post. so glad to read these thoughts thank you! ‘Tumblr propaganda campaign’ – Hmm, now you are getting involved in politics and determining what is and isn’t propaganda? You ruined what would have been a very good and sensible article. That’s not a judgment call on my part, Kim — any information distributed by a government (on either side) during a war is almost by definition propaganda. Thanks for the comment though.